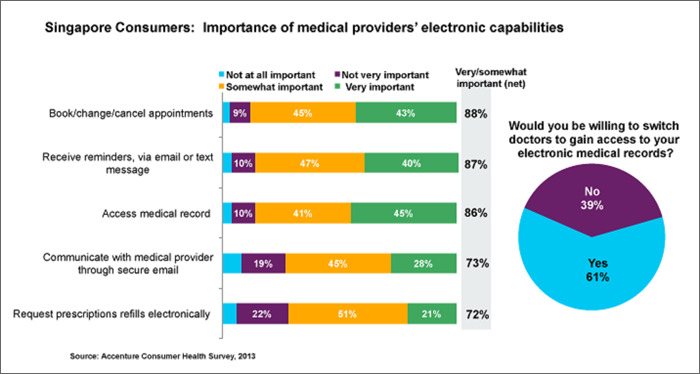 More than half of consumers surveyed have taken ownership of records by self-tracking personal health information. SINGAPORE; Oct. 17, 2013 – Supporting the growing trend towards patient engagement, a recent Accenture (NYSE:ACN) survey found that the majority of consumers in Singapore (61 percent) would be willing to switch doctors to gain online access to their own electronic medical records (EMR). The survey, of more than 9,000 people in nine countries, shows more than half (63 percent) have taken ownership of their medical information by self-tracking their personal health data including their health indicators, such as blood pressure and weight (36 percent), physical activity (34 percent) and health history (32 percent). “This growing trend of self-care among consumers is evolving the role of healthcare technology and empowering greater shared decision-making among patients and doctors”, said Corissa G Leung, Accenture’s managing director for the ASEAN Health Industry. “Just as patients can self-manage most other aspects of their lives, when consumers are part of the healthcare process it can increase their understanding of conditions and serve as a differentiator for clinical care”. In Singapore, nearly all consumers (96 percent) say they should have at least some access to their electronic medical records, with roughly three out of four (73 percent) surveyed saying they believe they should have full access. In contrast, slightly less than one third of Singapore doctors (30 percent) believe patients should have full access to their own medical records and more than half of doctors (63 percent) say patients should only have limited access. Accenture conducted an online survey of 9,015 adults ages 18+ to assess consumer perceptions of their medical providers’ electronic capabilities across nine countries: Australia, Brazil, Canada, England, France, Germany, Singapore, Spain and the United States. The survey, which included 1,001 Singapore consumers, was fielded by Harris Interactive in July 2013. Where relevant, the survey compares select findings from the Accenture Doctors Survey to compare the doctor and consumer responses. Accenture is a global management consulting, technology services and outsourcing company, with more than 275,000 people serving clients in more than 120 countries. Combining unparalleled experience, comprehensive capabilities across all industries and business functions, and extensive research on the world’s most successful companies, Accenture collaborates with clients to help them become high-performance businesses and governments. The company generated net revenues of US$27.9 billion for the fiscal year ended Aug. 31, 2012. Its home page is www.accenture.com.